If you’ve counted the number of bike shops on your block lately, it will not be a great surprise that Toronto has an active—and political, and sometimes messy—cycling culture. Add our easily navigable street grid to the cost of cars, parking, and monthly transit downtown and in the inner suburbs, and it’s clear why your bike is an increasingly popular way to get to work in the morning. So if you’re thinking of making the move to a condo—or the move to full-time cycling—here’s a quick guide on how to navigate the perks and challenges of condo living when you commute by bike. As well as saving on commuting costs, cycling can save you more than a little on rent. Since parking spaces in most Toronto condominiums add from $100 to $300 monthly to the condo fees (and, trickling down, to the amount you’ll pay in rent), looking at units without dedicated parking can save you that much right off the top. If you’re in love with a unit that does have a parking space, see if your landlord is willing to rent the space separately or sublet that spot. There are legions of people commuting every day—especially if you’re renting downtown—who would love the idea of a dedicated parking space close to their office, and the reduction in rent your landlord gives you might well turn into a net win for them if they’re able and willing to sublet that parking space to a commuter. Parking spots aside, commuting by bike lets you check out units which are just a little farther out from TTC stops and closer to the network of side streets that host Toronto’s dedicated bike lanes. Those extra few blocks will be a breeze on a bicycle, and units a few blocks up a side street or away from the subway line tend to be that much more affordable than ones right next to the subway. 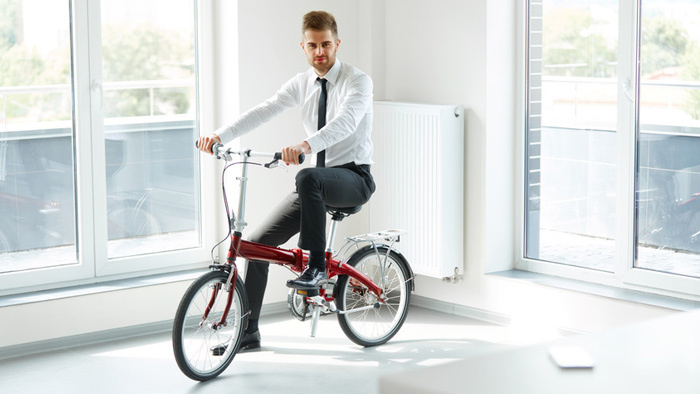 While the rules in older condos around bikes and storage are in flux, many condos have rules against storing your bike on the balcony, for good reasons: Bikes on balconies mean road dirt tracked through elevators and halls, and your own unit’s floors, and that means more cleaning for both you and your property management company. Find out, when you view a unit, how it deals with bikes and cyclists. If you can store your bike on the balcony, keep it clean and you’re ready to go. What’s more, many newer condos are designing with bikes in mind and offering amenities like special bicycle lockers, bike parking inside or at the back of the building, hobby rooms which let you do your spring tuneup inside, and even in-house bike share programs for building residents. Some older buildings have converted some of their parking space into bike storage by hanging bike racks in their parking garages. So if you can snag a unit in a building with cycling amenities, there’s even less to worry about—and more space for you in your unit while your bike sleeps securely behind a locked door. However, if not, have a plan before you rent as to how to handle your overnight storage, and where you’ll keep your bike through the winter if you’re not an all-weather cyclist. Once you’ve sorted what the boundaries are, there are ways to easily work within them. While many condo buildings have rules against bikes on balconies, they don’t hand out demerits for keeping your wheels inside the unit proper. If your landlord’s all right with you mounting a small wall shelf and you’re willing to plaster the holes at the end of your lease (ask first! ), there are wall-mounted racks available from Mountain Equipment Co-op or other downtown stores for under $20—ones that support the bike by its frame while you’re in, and look like a normal wall shelf while you’re out. They’re a great way to keep within the rules, keep the floors tidy, and not use up any of your precious floor space. If not, check out units that come with lockers: They’re a great place to park your bike securely, and usually connect to a parking area for easy roll-out in the morning. Yes, they’re everywhere, but having a few bike shops you like and trust between work and home can mean the difference between getting a flat fixed almost instantly and having to wait—and ditch your bike at home—until the weekend, when you can get to your local. To way too many Torontonians, Mel Lastman Square doesn’t mean much more than our former mayor and his current furniture commercials. But since it opened more than twenty-five years ago, it’s been a hub for the arts, cultural fairs, reading, lounging, and laid-back—usually free!—community activities. 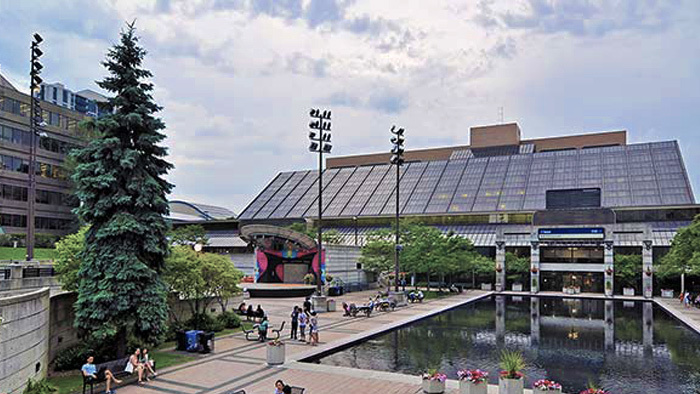 So for the second installment of our Get Outside series, let’s discover Mel Lastman Square. The public square and courtyard of the old city of North York’s civic centre, Mel Lastman Square is a huge, quiet gathering place for families, lunching city and TDSB staff from the huge offices next door by day, and a bright, robust cultural space by night and on the weekends. With 20,000 square feet of both paved and green space, an pond that turns into an outdoor skating rink for winter, an amphitheatre, and outdoor table tennis spaces, it’s no surprise that the square’s in such high demand for large-scale festivals. It’s got the space to hold multiple events at once without anyone feeling crowded, and can spill into the huge North York Central Branch of the Toronto Public Library to cool off or host talks and sessions. So what can I do there? If you grew up in north Toronto, Vaughan, or the artist formerly known as North York, you already know that Mel Lastman Square has had an amazing live music game for decades. Bands from the small-and-local level all the way up to Matthew Good, Finger Eleven, the Rheostatics, and most of the last twenty years of big-name CanCon music have played Mel Lastman Square, pretty much for free. Sunday Serenades series spotlights swing, big band, and jazz bands, with more than enough space for you to dance under the stars. With everyone from retirees to the local branch of Toronto’s swing and Lindy Hop scene on the dance floor, they’re a great excuse to dress up, slap on some femme fatale lipstick, and grab your favourite partner even if they’re broke this week. Friday nights in the summer are reserved for the Cultura Festival, which is going to cycle outdoor film screenings, R&B artists, fire-jugglers, dance companies, interactive exhibits from the ROM, hula-hooping, and more through the space every week. On top of that, the square recently hosted one of the city’s official Canada Day celebrations, with circus acts, free face painting, salsa and jazz bands, and fireworks—and they put on a similar large spread for New Year’s. The old North York is one of the more diverse neighbourhoods in the City of Toronto, and Mel Lastman Square’s programming does a great job at offering up space for the area’s larger cultural groups to meet, mingle, and celebrate. The square’s calendar features Persian Family Day, the Latin Arts Festival, the Iranian Summer Festival, the Kurdish Festival, and the Korean Harvest Festival all coming up just this summer alone, and gives you a great chance to get to know your neighbours, share delicious treats, and get involved with cultural organizations and arts groups across the northern swath of Toronto. While Mel Lastman’s fitness game is more aligned to events like September’s Health and Culture Expo and hosting the RBC Run for the Kids, it’s right next door to the Douglas Snow Aquatic Centre, a large indoor pool and fitness space which offers both registered and drop-in fitness classes. Douglas Snow’s full schedule includes free swim and organized classes through the city, yoga, cardio, tai chi, and dance. While it’s surrounded by restaurants and shops as part of the Yonge-Sheppard corridor, Mel Lastman Square’s branched out into the eats game hard. Its Thursday farmer’s markets have been a mainstay since 1994—officially before farmer’s markets were cool—and span past the usual fresh fruits and veggies to cheese, meat, artisan bread, honey, herbs, preserves, and handmade soap. For the day of, you can get fresh smoothies, cabbage rolls, pierogies, pies, and more ready-to-eat. The great thing about Mel Lastman Square is that it’s super accessible: Located at 5100 Yonge Street, right above North York Centre Station, it’s easy to get to—or home from—whether you’re coming from downtown, the old city of North York, or Vaughan, Markham, and Richmond Hill via the Viva Bus and York Region Transit terminal one stop north at Finch. There’s also ample parking in various paid lots around the square, including a Green P on Beecroft Road, meter parking on the side streets in the neighbourhood, and underground parking at the civic centre itself. With an abundance of free fun and its laid-back air during the weekdays, Mel Lastman Square is definitely a place to mingle with your neighbours, make friends, try new snacks and experiences, and be a part of the common space that is your neighbourhood. 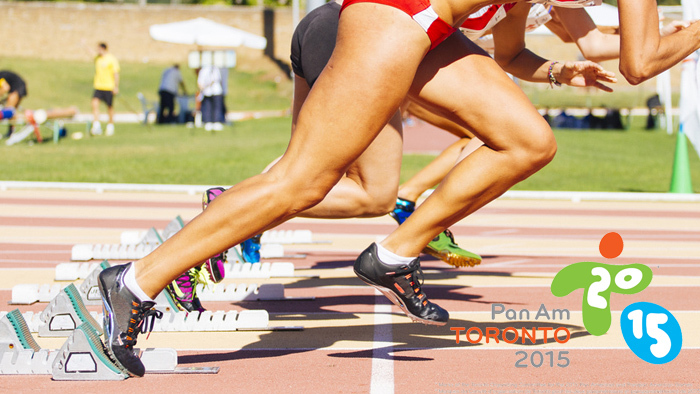 Check out their event line at 416-395-7582 for the latest schedule updates, and get outside! Toronto’s urban sprawl tells a story about how we used to live: detached house, full yard, and space as paramount. 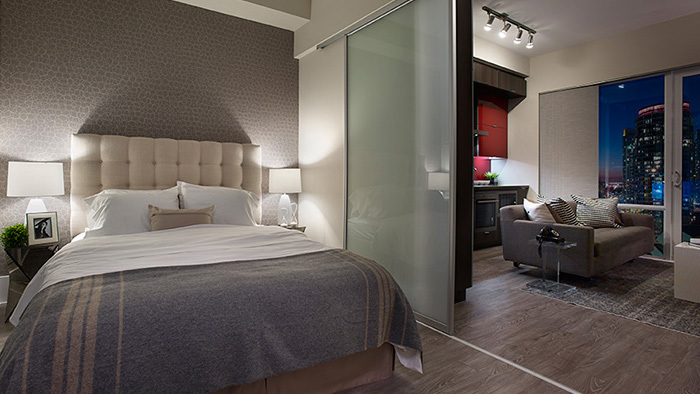 But with micro condos—condos of 500 square feet or less—making up 11% of the new condos coming onstream in the GTA this year, the shift from car culture to transit-friendly, neighbourhood-centred, community culture is in full swing, as Toronto buyers and renters are embrace the advantages of a clean, compact lifestyle. Here are four ways choosing condo-sized living can change your day-to-day routines—for the better. 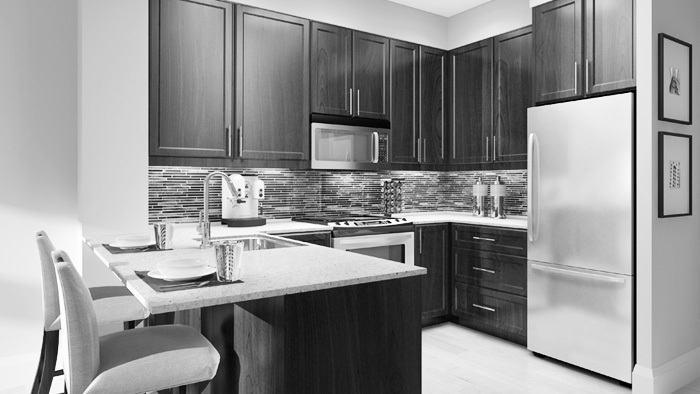 1) Say goodbye to high heating and utility bills. Most condo corporations don’t meter out heating, water, and hydro costs on top of your monthly rent: They combine those costs, along with your share of any major capital repairs, into a fixed monthly charge called condo fees, which are set by the condo board. The budgeting benefits are part of what’s attracted buyers and renters of all ages to condominium living. The next big cold snap won’t wreck your budget once the heating bill comes in, and fluctuating hydro rates are absorbed and evened out over the year. On top of that, your share of your building’s condo fees is allocated based on the square footage of your unit—anywhere from 50 cents to a dollar per square foot, depending on the age of the building, how many amenities it contains, and how many units are there to share the load. So a smaller unit means a lighter load when it comes to condo fees—and your entire utilities and heating bill, letting condo owners keep their costs down and condo renters, more often than not, see their entire utilities bill included as part of their monthly rent.